Welcome to the Twentieth Edition of the Owen Guns Bulletin. Special Prices can only be held for 14 days from the release of this Bulletin. The CZ 452 actions are manufactured from steel billets not tubing or pipe, the barrels are hammer forged for accuracy and long life. The action has a dual opposing locking lugs and a 3/8s Dovetail for scope rings. The trigger is adjustable for weight, and the safety is located above the rear of the bolt and provides a positive firing pin block. These have 10 round magazines fitted and five round magazines are an optional extra on this line of rimfire rifles.These Rimfire rifles produced by Ceska Zbrojovka Uhersky Brod are among the most sought-after firearms in the world. The CZ 452 features attractive wood stocks without checkering, hammer forged barrel with tangent iron sights and simple adjustable trigger. 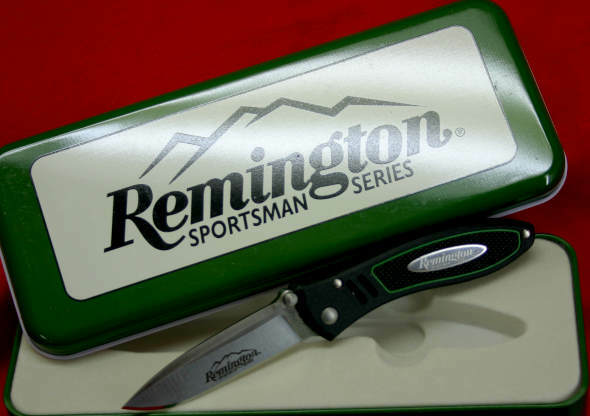 • Incredibly rugged – the Riflemans 1″ maintube aircraft-grade aluminum to withstand heavy, repeated recoil. If you want to get a scope on your rifle Weaver will have a base for your Make and Model. 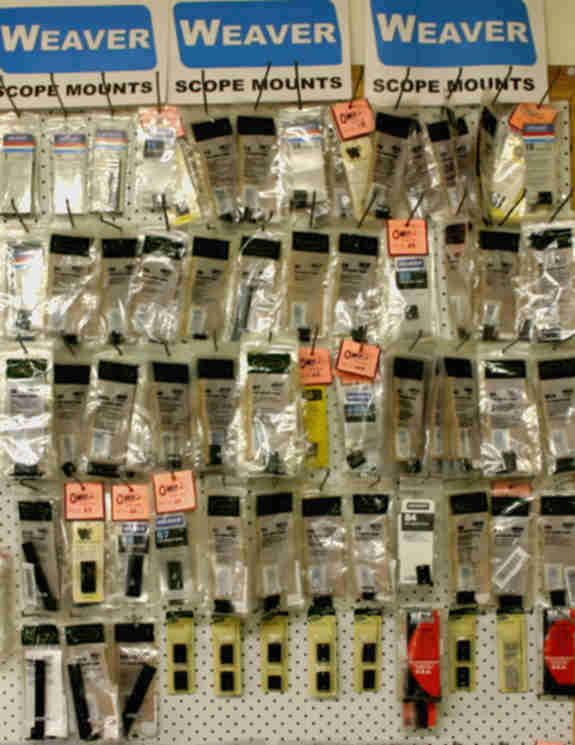 Weaver Scope Mount Bases Most (90%) are from $12. each. Elaborate shapes are more expensive. Phone 07 54 825070 or 07 54 824099 for a price. 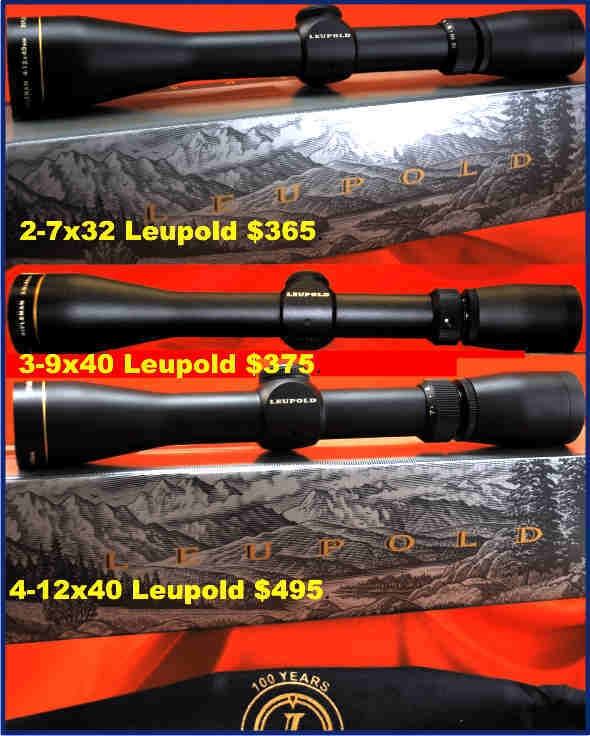 These Japanese manufactured rifle scopes made for the big companies in the USA are improving there quality, constantly closing the gaps between them and their Eupropen competitiors. The only thing that seperates most top end scopes these days is the price. This is the (Jain Way) JW Model 105, Sometimes called Norinco. These rifles are made in the same factory that manufactures the now famous JW 15 .22 rifle (the Brno Mod One Copy) if you have had a JW15 or know of anyone who had one, you will know that they shoot sometimes better than the rifle they imitiated. 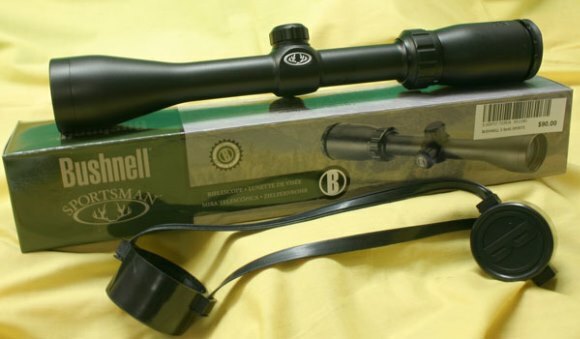 These JW105 s are in .223 Remington calibre and have a five shot detachable magazine. They also come with Weaver style mount bases and Quick Detachable studs for QD sling swivels If you look carefully at the close up photograph you will notice a shiny silver colour, at the breech face,the camera has picked up the chrome plating from inside the chamber. The Chinese are the only non-military manufactures that can afford the chrome process of plating the Barrels and Chambers. They have also chromed the forward section of the Bolt. Chrome plating gives the best protection against erosion and corrosion than anything else besides regular cleaning. The JW 105 is a copy of the Gevram that was very popular in the 1950s and 1960s, they were very good quality but I believe that Gevarm had to stop making them as the were too expensive to produce. 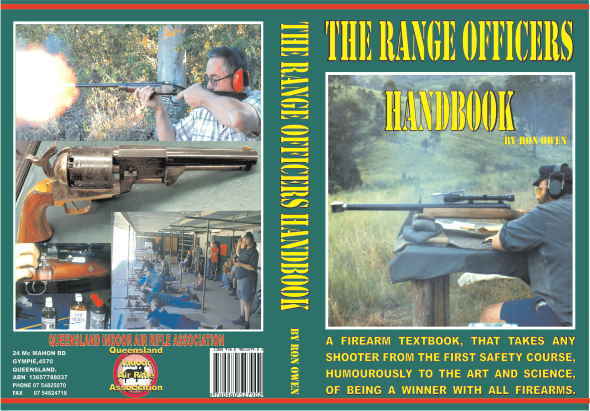 As already purchased by members of all Shooting Organisations. Do You Want To Get A Queensland Shooting Licence? Ph Jason Harelle 54824099 work hours. 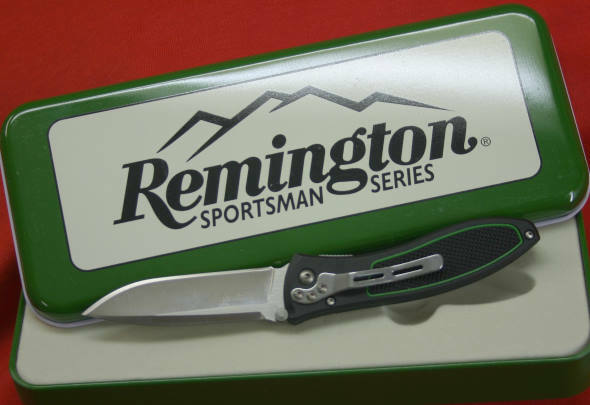 Remington Folding Lock Knife $30. plus postage. An example of ordinary, commercial chambering as turned out for the average “hunting” rifle, in the above case a factory job for the .25/20 or 44/ 40 leaver action cartridge. This pictured is rather a sloppy chamber for this day and age, but I have seen many that were much worse than the example shown. 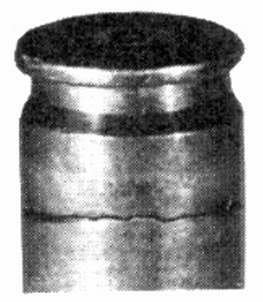 Note that a rimmed cartridge positions entirely by the rim of the case and in a poorly made chamber such as this the cartridge “sticks up” into the chamber neck with no other support, unless it drops to the bottom of the chamber which it probably does if not held off by pressure from the extractor. Observe how poorly the bullet fits up into the leade of the above chamber; with such a long jump as this it is to be expected that much leakage and gas-cutting would occur. 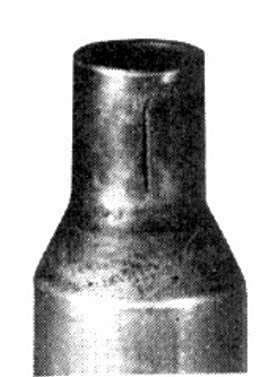 (One of many problems for lead bullets) After being fired in an oversize chamber such as this, the empty case would look entirely different from an unfired sample and full-length resizing for most leaver actions is almost a necessity if the case are to be reloaded and fired again. Headspace, as measured, is shown by the dotted lines above rim of cartridge. Rimmed cartridges are much easier to manufacture to exact specifications than is the case with rimless ammunition, the vital head-space tolerances being so much easier to meet. Model 1873 Winchester Lever Action, Very suitable for a rimmed cartridge case. The rimmed cartridge is suitable for use in the “up and down” actions, such as the falling block single shots, the tubular magazine and lever action repeaters, double barrel rifles, and three barrel guns. By its use chambering difficulties are reduced to a minimum, and extraction is more easily effected by means of hook or wedge action extractors. The most modern and safest cartridge cases of today are of the belted type, designed by Holland and Holland, the famous British gunmakers and the .300 H. & H. Magnum, shown above, is one of the most popular of the series. It is a very accurate long-range target cartridge and, when loaded with expanding bullet, a most deadly and powerful hunting cartridge. The belted cartridge positions on the front ledge of its belt, as shown; it is a rather easy headspace dimension to meet. Best of all, this type of case is particularly suited for use with heavy powder charges developing extreme pressures. Note the exceptionally thick area of brass in the head of this case, sidewalls as well as base, and note how slight are the chances of the case head blowing out through the bottom of the lug well as can happen in the fitting of the rimless case. The chamber shown above is a good example of proper cartridge fit and positioning; note how accurately the bullet is seated up into the chamber leade. This represents average chambering for such a cartridge, as a rule Holland & Holland rifles run into money and they are finished properly in all such respects, all work being performed by master gunsmiths, stockmakers and barrel makers. Such powerful cartridges should only be used in rather heavy rifles having barrels of sufficient diameter for the ballistics developed. As shown in Edition 19 as the rimless case is ideal for feeding from machine gun links and stacks nicely in magazines for semi-automatic and automatic fire but it still has certain headspacing problems and is not ideal for firearms that are not bolt actions. To alleviate those difficulties the belted magnum case was produced first by the famous Holland and Holland, British rifle makers, to give more positive headspacing with all types of firearms such as double rifles, three barrel drillings, falling block single shots,and would still feed perfectly through the double column type of magazine seen in Mauser and similar bolt action rifles. As will be seen in Diagram 8, there is a shoulder on the case at the front of the head and slightly in front of the extracting groove. This shoulder abuts and stops against a similar shoulder in the chamber. Headspace is measured from the face of the bolt to the shoulder in the chamber, and is obtained in the same manner, and should have the same relative tolerances as with a chamber for a rimmed cartridge. We have still have other types of case to consider, namely the rimless straight case that headspaces on its mouth and on the front end of the chamber as shown in Diagram 9 of the .45 Auto 1911 a1 pistol sketch. This drawing illustrates the actual chambering of a cartridge which seats on its case mouth, it also illustrates the head spacing of such an assembly which is actually the entire length of the case. Drawing was made from a cut-open barrel of a Colt .45 Automatic pistol, the dimensions of which were closely followed so as to also show the principle of making such chambers tapered so they will more readily take and seat cartridges more freely from the automatic action of the arm. The dimensions and tolerances shown are actual, as can be seen by inspecting the barrel from a .45 automatic pistol and checking with a live cartridge. Note how fully this cartridge seats up against the front edge of the chamber, where it positions for firing. The actual assembly, when tested by hand, is very interesting on account of the extreme “wobble” of this .45 cartridge when in position in the chamber. The .38 Super Colt is a much closer fit, with less than half as much free play. 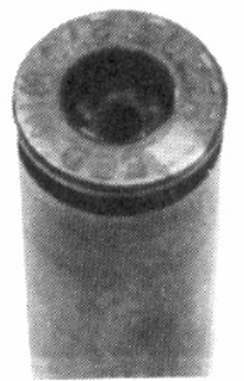 Observe from the cut-open area of this cartridge that the rear end of the .45 case must take its part in retaining pressures from the burning powder charge of the.45 Automatic pistol; the entire rear end of the lower portion of the cartridge is unsupported by any retaining walls of steel, as is the case with the conventional rimmed chamber; this practice would not be possible with a cartridge developing probably 30,000 or more pounds pressure, yet in the case of this .45 Auto cartridge the brass case walls are amply sufficient to retain what the ballistic engineers term “residual pressures.” At that, some of the .45 Automatics throw out cases pretty badly swelled around this under and exposed portion of the fired case. 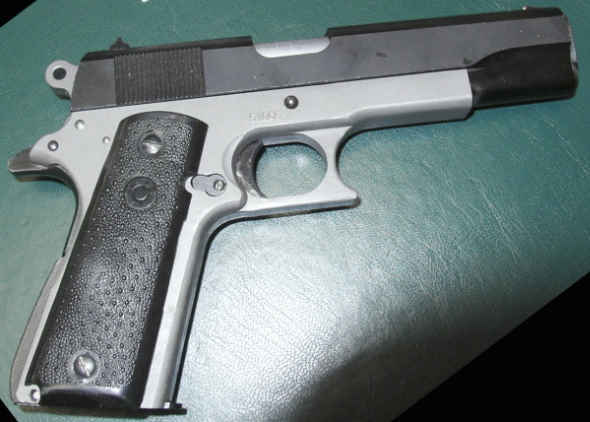 .45 Auto 1911a1 frame made by Enfield Arms Gympie. Examples of this case and cartridge are the legendary .45 caliber Colt automatic pistol cartridge and the U.S. Caliber .30, M1 Carbine cartridge. The Walther P38 The 9mm Luger and the Owen Gun, the MP 40 the Bergman and the Sten Gun all headspace in this manner. The case is rimless without any shoulder and almost straight sides, and it depends on abutment of the mouth of the case against the front end of the chamber, as shown in the chamber Diagram 9, to hold the head of the case tight against the face of the bolt. Therefore the overall length of the chamber is the headspace. This should be cut very accurately to just the length of the max cartridge case, and the cartridge cases must be held to a close variation of not more than .005 inch in length so that the min case will not be too short in this chamber. This drawing illustrates the seating and positioning of the .38 Colt Auto cartridge, which is a semi-rimmed case. But in this particular instance, the seating principle is not any too clearly illustrated, as only a very small segment of the case rim is used to position the cartridge; however, this fact alone makes the drawing of interest. Note, from the insert drawing, how small a contact holds this cartridge in proper position for firing, and note also that the forward mouth of the case does not bear against the end of the chamber. The .38 Auto Colt is not a cartridge whose manufacturing and chambering tolerances are stipulated by the Military and the Colt Company therefore chambers its automatic pistols to much closer dimensions than is the case with the .45 Automatic pistol. Note that this .38 Auto is much more closely chambered than the .45 Auto shown in Diagram 9. Edition 21. Leade is not a Typo. Understand its Importance. Having covered ‘measuring powder’ for the next few editions we will concentrate on articles concerning the cartridge case, this article was first published in Lock Stock & Barrel in 1981, there has been an awful lot of water under the bridge since then, its nearly thirty years ago, but includes a lot of important information on the subject. Deciphered, translated, edited, altered and otherwise rendered halfway readable by Malcolm Bone. 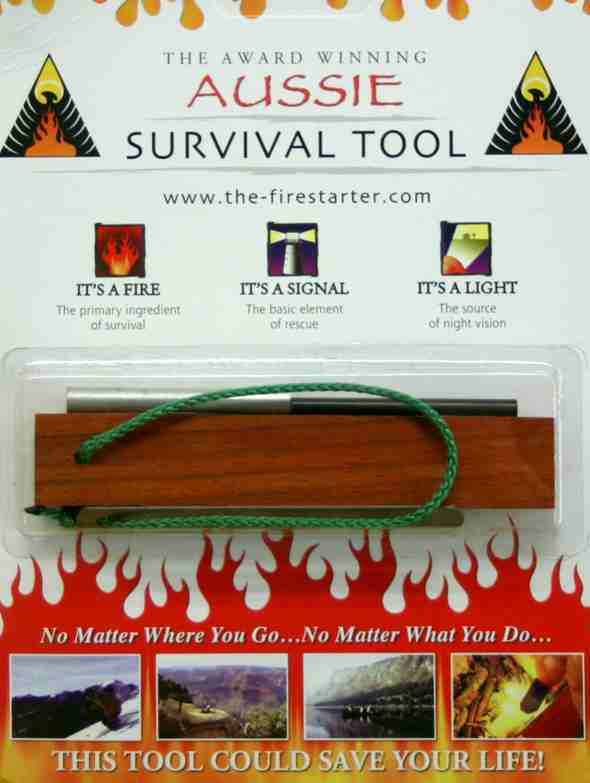 A popularly held belief by large numbers of the Australian Centre Fire shooting fraternity is that neck-sizing is the way to go and full-length sizing wrecks your brass. There are numerous exponents on the subject of reloading who, in print, voice the opposite opinion. The R.C.B.S. test, done by Fred Huntington used a Winchester Model 70 in .30-06 calibre. He first fired some factory ammunition and chrono-graphed each shot. Using the same brass he reloaded it using 150 gr Speer bullets. The hand-loads were about 80fps faster, and pressure presumably was a bit higher than in the factory ammo. He used Remington and Winchester ammo, and loaded and fired the brass until it became unserviceable. The first case was eliminated at the 36th firing, the next case went with the 50th firing, third the 52nd firing and the final one at the 55th firing. Split necks were the cause of all case failures. All brass was full length sized each time it was loaded. The most important point R.C.B.S. made was that the hand-loader who can use brass that often, saves considerable money, plus, full length sizing is a lot easier and it contributes to extending brass life. Other than the benchrest contingent, most shooters seem to hold case life next to Godliness when it comes to reloading. So Lock Stock & Barrel decided to reload a few cases to destruction – by repeated reloading, not overloading – and seeing that the R.C.B.S. test used Remington and Winchester brass, we decided to use Federal. 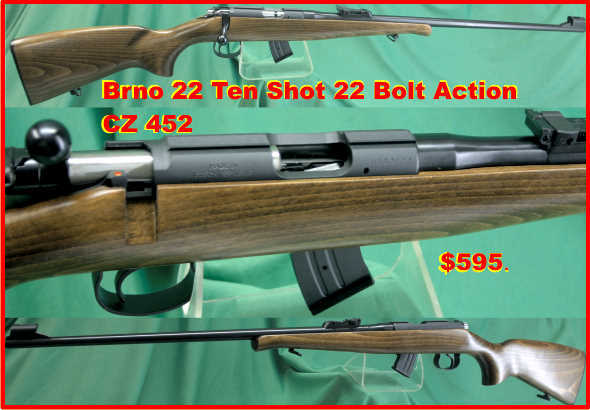 Rifle – Bruno 600 ZZK in .270 Winchester. Reloading equipment – Pacific and Redding. Primers – large Federal benchrest. Projectiles – Taipan plain base soft point, 170 grains. Shoulder – top right-hand side of Ron Owen. Cases were carefully wiped clean of case-lube before every firing. Primer pockets were not cleaned at all throughout. Whilst tempted to use only two cases, to minimise the amount of shots to be fired, we concluded that an early case failure by either one would prove very little. We therefore opted to use four cases. The brass selected was once fired Federal Factory Ammunition – 2 were full-length sized and another 2 were neck-sized. Partially neck-sized might be the better term, as we didn’t have a true neck-sizing die. Our neck-sizing was achieved with a full-length sizing die backed off about .2″ from the full-length sizing position. This resulted in half the .4″ neck section being sized and no significant sizing of the rest of the case. Careful measuring of the cases after the initial sizing showed the overall length of the neck-size cases to be 2.546″ and 2.554″, while the full-length sized cases were 2.551 and 2.557″. Diameters at 1/4 inch” forward of the base were .470 for the neck sized cases and .467 for the full-length sized cases. Not having loading tables for Winchester 785 for the rather heavy 170 grained bullet, we started out using a charge of 50 grains. This seemed fairly mild so we increased to 51.5 grains after the third firing. After the fourth firing, the primers of the neck-sized cases showed signs of pressure whereas the full-length sized case’s primers were quite normal. The fifth and sixth firing showed the same results. Seeing that no pressure was evident in the full-lengthened sized cases, the load was increased to 53 grains. This time both primers in the neck-sized cases were flattened and again the primers in the full-length sized cases were quite normal. At the ninth firing one of the neck-sized cases split at the neck. Firings continued with this load, and each time the neck-sized case showed pressure signs on its primer. Firings continued uneventfully until the nineteenth firing when a tiny dent was noticed on the neck of a full-length sized case. After the twentieth firing, a tiny hole appeared at this place and a full-sized split appeared after the twenty-first firing. No further eventualities were observed up until the thirtieth firing so 54 grains of powder were loaded from then on, in order to bring the test to a quicker conclusion. At the forty-fourth firing with one neck-sized case and one full-length sized case still going strong and the reloading and firing getting a bit tedious the load was further increased to 55 grains. At the fifty-fourth firing darkness came upon us and proceedings were adjourned. A couple of days later the test was resumed, again with a load of 55 grains. The very first firing resulted in a split neck for the neck-sized case. After the fifty-eighth firing with the remaining full-length sized case, trimming was required as chambering was getting difficult. High noon seemed to drag on, with the only change to occur being appearance of a slightly pinched area in the neck at the seventy-second firing. This deteriorated still further at the seventy-sixth firing and finally the neck split after the seventy-eighth firing. This is where we get egg on our faces – we don’t mind to admitting to being amateur writers but we did not think we were so amateur in the shooting and reloading field. The rifle we used was not chambered particularly well and the calibre, with its steady angled shoulder, is supposed to produce bad case life, with lots of trimming required especially when using solid loads. We had chronographed a couple of loads with the 55 grain powder charge and these indicated about 2700 fps which for a 170 gr bullet was pretty good. But a virtual absence of case trimming had us a little intrigued. So then we weighed a bullet – 150 grains! Dum-de dum …..
We had received these projectiles from Taipan Industries of Yandina in an unmarked box. They were produced from fifteen year-old components manufactured on their machines by turning the machinery by hand before they had the power (electricity) connected. Editors Note. It was scribbled in handwriting on a smal piece of paper,in the box. (I should have checeked an weighed one of them) They were of heavy jacket construction and so were longer than the usual 150 bullet – they certainly looked long enough to be 170 grains. Now that we had our facts straight we checked the Winchester chart and found that they listed a 58 grain charge of 785 for their 150 grain bullet. Reflecting on this for a while – we had just done a destruction test on mild loads instead of on loads near factory standard as was originally intended – we reluctantly decided to re-do the exercise with the appropriately increased powder charge. Four more Federal cases were taken from the same batch that we took the brass for the first test, and we proceeded as in the previous test except that our powder charge was now 58 grains of Winchester 785. After 5 firings the two neck-sized cases were hard to chamber and so were full-length sized. A velocity check over a chronograph prior to this, revealed 2921 and 2938 fps from the 2 neck-sized cases and velocities of 2964 and 2974 fps were obtained from the full-length sized cases. After 13 firings and nothing untoward happening the prospect of another long jolting day was not greeted with enthusiasm so the load was increased to 59 grains, again with the hope of accelerating case failure. This resulted in velocities of 2981 and 2982 fps for a couple of neck sized cases and 2989 and 2999 fps for the full-length sized cases – at least now we were even exceeding factory specifications. Primers of course, were now well and truly flattening but at least they weren’t cratering around the firing pin indentation. At the 16th firing a neck-sized case had its primer pocket so stretched as to not be able to hold a primer and was thus discarded. At the 17th firing all remaining cases needed and received trimming. The remaining neck-sized case also required a further full-length sizing after the 18th firing. Following the 21st firing, partial head separation occurred to the remaining neck-sized case. Another velocity check at the 24th firing of the two full-length sized cases showed velocities of 3000 fps and 2984 fps. Head separation occurred to one case at the 37th firing and the final case became unsafe for the same reason after the 44th firing. It goes without saying that we were pleased the test was over – the near neighbours were even more pleased. Having done the practical test, now we get down to theorising. Obviously, full-length sizing is conducive to greater case life than neck sizing by almost double. The other really curious observation, arrived at by accident because of our mistaken assumption on bullet weight, is that all the mildly loaded cases failed by splitting longitudinally at the neck, whilst the loads generating near maximum safe pressure, all failed from head separation. Yes, even the first case to fail which had the stretched primer pocket also had a tell-tale ring of weakened brass at the point where the head separation occurred on the other cases. We can readily find a reason why the head separations occurred on the heavy load test. This is caused by brass flow, which means the sides of the brass case are actually stretched forward from the solid case head. This movement results in the case eventually becoming too long overall and thus brings about the need for trimming back to the specified length occasionally. I suppose it is not actually an instance of the case walls flowing forward, so much as an instance of the case head stretching rearward – especially in excess headspace conditions. At the moment of firing, the firing pin protrudes from the bolt, contacts the primer, and moves the entire round forward. When the round gets fully forward, the firing pin which is still travelling forward, now dents and thus ignites the primer, and the powder burns. Maximum pressure occurs very near to this point which expands the case against the chamber walls and by friction locks it there. The solid case head containing the primer and incorporating the rim, cannot expand against the chamber and yet against its base, on the inside, it is subject to the same pressure as all other inner surfaces. There is a gap (called headspace) caused by the cartridge being pushed forward, between the base of the cartridge and the bolt face and there is around two times (1.99 times for the .270 Winchester, 1.7 times for .308 Winchester and 3.3 times for the .22-250) the force being exerted on the case head from the inside than there is being exerted on the bullet as it accelerates up the barrel – so something has to give. Either the case head drags the whole case to the rear until it connects the bolt face, or it connects with the bolt face anyway but stretches away from the rest of the case. With lighter loads the case will follow the head with a minimum of stretching. With heavy loads and higher pressures, friction of case to chamber is much greater thus resisting case movement and so stretching is prevelant and sooner or later results in separation. The greater the headspace the sooner the separation. ‘Brass flow’ forward does occur during full-length sizing, particularly if the case was expanded greatly in diameter. Brass stretches readily during firing but greatly resists being compressed during sizing and seems to prefer to retain its outer surface area. When the diameter is forced to reduce during full-length sizing, the length becomes greater as a result of its efforts to keep its surface area the same. We can accept also that the neck of the case is subject to the roughest of treatment during firing. Not only is it flung open at almost instant high pressure, but also, all of the burning gas ‘scorches’ through it. This, plus the resizing process serves to harden the brass and make it brittle, no wonder it tends to split. The annealing or softening process for brass is to heat it red hot (or rather pink hot – brass may melt at red hot) followed by immediate quenching in water. The immediate quenching in water is a crucial part of the softening process. The burning gas passing through the neck would be hot enough to bring the neck to red hot but because of the short time the heat is applied and the cases close contact against the chamber, which takes much of the heat away, the brass doesn’t reach annealing temperature (just as well as brass has very little strength or cohesian at pink hot temperatures), plus the case cools slowly after firing. This expanding, plus the heating and slow cooling which tends to follow the annealing pattern but without imparting any of the softening process, only serves to harden the brass and eventually makes the neck, in particular, quite brittle. What we don’t understand is why the splits did not occur at all during the maximum load test. Whereas in two instances prior to splitting an indentation was noticed in the case neck, we considered that perhaps a speck of unburnt powder may have lain between the case neck and chamber which may have caused the indentation and initiated the fracture. However, super-glueing a tiny granual of powder to the neck to check this theory, resulted in a different shape of indentation, didn’t precipitate a neck split and the case reverted to normal during the next firing and after the remains of the granual had been removed. We note also in the first test that the neck sized cases gave no warning of an impending split (sounds like parliamentary procedure) – they looked 100% prior to firing and were split when extracted. The full-length sized cases both exhibited a tiny dent first and then a hole or small split, followed by a large split. The split did centre about the half-way mark in the neck in every instance which could indicate as far as the neck sized cases were concerned, that the ring where the neck-sizing ceased was where the greatest intensity of metal fatigue could be found. It would take a lot more testing with greater numbers of cases to prove even this small aspect one way or another. There are numerous theories why full-length sized cases last longer. R.C.B.S. suggest that because the brass flows forward during full-length sizing, then that section of the cases neck which was at a high stress point in relationship to the chamber, moves forward (very slightly) so it is situated for the next firing at a point where stress may be less. Case life aside, Sierra suggests that while neck sizing requires minimal working of the brass in that the shoulder is not touched, it is thereby possible to off centre the neck and problems with accuracy may develop. Full-length sizing will correct that error. Sierra found that for best accuracy virgin brass (new and unfired) should be used and the next best was with first, second, and third fired full-length sized cases. Settling the question of neck-sizing or full-length sizing for ones own conditions as to case life, could be a worthwhile endeavour. If you can find out why some cases last 8 times longer than others and take appropriate action, you stand a good chance of shooting 7500 rounds or more with 100 cases – just think, buy 100 cases with your rifle and use them for the life of three barrels. Next Edition, More on Cartridge Case Preparation. A Free External Ballistics Calculator for all Componants not Brand Specific. Email : OwenGuns@spiderweb.com.au and the Externla Ballistics Calculater program will be sent to you in EXCELL Format free of charge. 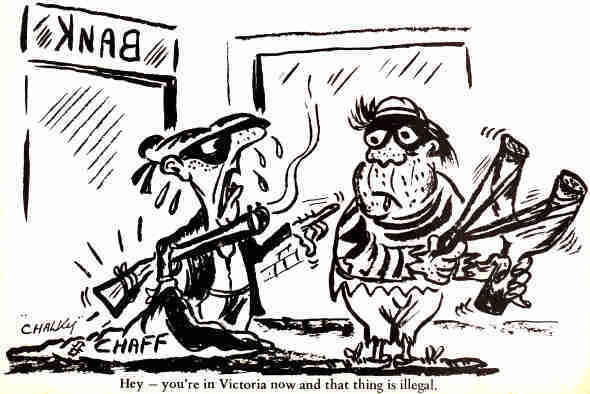 Nearly thirty years ago in 1981, in the first few editions of Lock, Stock & Barrel, the editorials and cartoons warned of the impending prohibitions on firearm ownership, and the troubles. 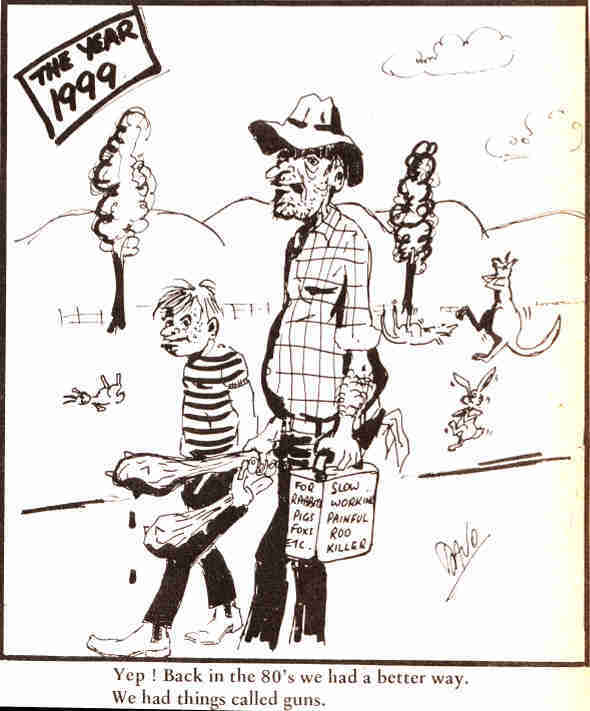 I can remember one cartoon which had a farmer and son equipped with a poison bottle trying to protect their property from the vermin and pests that were eating them out of house and home. Another cartoon lampooned the stupidity of banning catapults (sling shots). Someone then wrote in with a letter to the editor and said that guns would not be the end of it, they would move on to, ban the poisons, the catapults, the knives. We all respected what was said and published the argument that our leaders wanted to progressively disarm us even though we thought that we would never see it happen. We hoped and thought that the people would not stand for it. That the leadership would change and we would never really be confronted with such a totalitarian regime. Regimes with dictatorship principles which our previous generation had fought and died to oppose. We did not believe that the general population would accept it and that eventually the general populous would wake up and shrug off these inhibiting chains restricting their freedom. 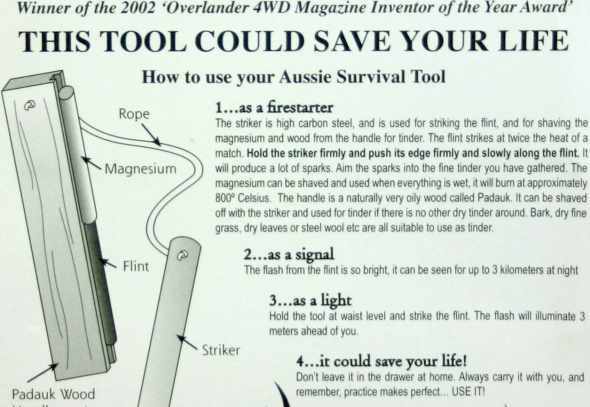 I can recall writing articles pointing out that in the annual statistics over 42 % of all Australian homicides were committed with knifes and 26 % beer bottles, firearms were less then 10 percent, the largest killer being Blunt instruments. In one years figures two males had been beaten to death with guitars by females. As modern music or the noise they make these days does instil a violent need for silence I could understand that. We may have been a bit ambitious with the year as it all happened in 1997. I mistakenly challenged the Anti Gun Lobby and stated that if they really wanted to ” If its saves One life, its worth it”, they should be banning Guitars and Glass and pointed to the statistics on the Beer Bottle. “Suppose it could be shown that Ford cars were used in 70 % of the time as a getaway vehicle after a hold up. Banning Ford cars, then would result in Holden cars being used 80% of the time. Banning them in turn could result in Datsun being used 85% of the time, etc. etc. until finally Rolls Royces would be used 100% of the time and they will naturally will have to be banned, so at last there will be no more robberies because there won’t be any vehicles in which to make a getaway ! Can anyone remotely imagine that this pattern will be any different with regard to firearms used in robberies? Guns don’t commit robberies, people do. Since Malcolm wrote that, it seems to have been like a play acted out stage by stage, and even though his last lines, “especially those which impose only on honest citizens can eventually bring about a general disregard for any and all laws by the public at large, In such a situation the Police could not cope.” seem to be the final closing act, unfortunately it appears that this circular dance which gradually expands its circumference to take in more and more freedom from the individual has not finished and is set to self perpetuate and feed itself like a cancerous Bolero dance. Two weeks ago the Headlines on the 6 o clock news (No one reads newspaper anymore) was ‘BAN GLASS IN PUBS’ after a week of beat ups tales of a new word “Glassings” the heading was loud and clear but slightly different, (BAN GLASS) in gone past the suggestion of plastic drinking cups in hotels and banning glasses. It then went past that to suggest legislation to ban glass bottles and any glass items anywhere. Well if its on the 6 O clock new and its going to save a life well it must be all right. More than likely the large manufactures think it’s a joke and think that it will never happen, their share prices may drop a little more and then it will all go away. As we have already been though this ritualistic dance we know different we will be sipping our drinks out of plastic cups and eating off plastic cups. The police will be busy searching premises without warrant on the suspicion there may be un-licenced glass on the premises. Who would have thought that they can charge people who have done nothing wrong but are allegedly a member of a Banned Bikers Club. the High Court stuck out the Federal legislation in the 1950s that banned the Communist Party as being un Constitutional. Freedoms worth fighting for have all been forgotten now, next they will be banning the plastic safety pickets that the alleged bikers killed someone with at Sydney Airport. Malcolm Bone was right, it has come to pass from bullying in schools to the ‘Glassings’s at hotels.The law has made itself into a disrespectful inhibition which is perceived as its only existence is to bind down the people, it has no remaining symbol of morality, of enabling people to live together in harmony and so is ignored and the police cannot cope, so the legislators hyperbolize, legislate again and if they don’t stop it and concentrate on defending good people, and condeming bad people our western civilisation will collapse even faster into the ensuing dark ages. 1. Ed McMahon died last week. He was a great entertainer. Prior to his stage accomplishments he was a distinguished Marine Corps fighter pilot in WWII earning six Air Medals and attaining the rank of Colonel. He was discharged in 1946 and was later promoted to the rank of Brigadier General in the CA Air National Guard. 2. Farrah Fawcett died last week after a long career in Hollywood as an actress. After she was diagnosed with cancer, she became an activist for cancer treatment and devoted her last remaining years encouraging people to seek treatment. She documented her plight on film and used it to encourage others to stay positive and upbeat despite their diagnosis and suffering. 3.Michael Jackson died last week. He was perhaps one of the most famous pop stars of modern time. He will also be remembered for his eccentric lifestyle that included sleeping with a chimpanzee, living in a carnival-like atmosphere at Neverland, his fascination with Peter Pan, and his numerous masks and costumes. He also admitted to finding pleasure sleeping with young boys and paying out millions of dollars in settlements to the families of these boys despite being acquitted by a court on allegations of sexual molestation. QUESTION 1 – For which of the above did the House of Representatives declare a moment of silence for on Monday? QUESTION 2 – Which of the above’s family received a personal note of condolence from President Obama? What sort of role models are they turning into hero’s? Creeps like Michael Jackson, if drugs kill these specimums, it might be a good argument to legalise drugs.For all the bannings of items, what good has it done, their suppression of the firearm sport and trade has not worked, NSW had over a 100,000 firearm licence applications last year so to did Queensland. Very soon the State Governments are going to be faced with an economic decision either they scrap long arm registration completly or they legislate again and make it twice as hard to get a licence or a Permit to Acquire in a vain attempt to cope with the mountain range of information that they have to maintain. The chains of finance may be the leaver that sets us free. Lets all put a bit of weight on it. Operators Manual for, Mossberg Model 500, 835 and 590 , Assemble Dis-Assemble Maintenance Exploded Diagrams General Data, Remember, one of the guns you used to own.